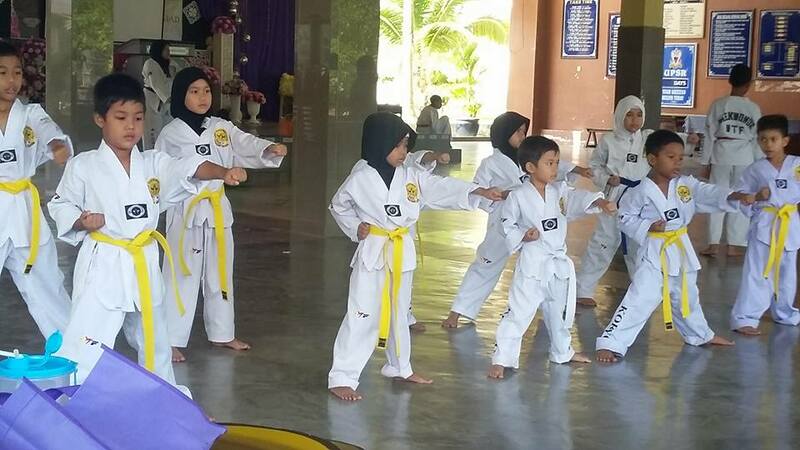 Since anakku join taekwondo mulai tahun ini, jom kita belajar sikit-sikit istilahnya... boleh lah buat modal bersembang dengan anak..kang dia sebut itu ini, kita tak tahu hehehe...sepatutnya my E-ein akan ada ujian tali pinggang kuning 2 mingu depan, tapi sebab kami akan balik kampung, she'll miss it.. dah bgtahu coach dia....sy pun tak kisah dia cepat atau lambat..so coach kata ok..next year baru ambil ujian join batch lain..
Kenapa saya pilih untuk anak belajar taekwondo? 2.yuran yang berpatutan RM30/bulanan, tapi pendaftaran ada add RM30(ni sekali je byr)..( tak termasuk baju dan belt).Jom kita baca apa itu taekwondo dahulu? "Tae" means "foot" or "to strike with the feet". "Kwon" means "hand", or "to strike with the hand". "Do" means discipline, art, or way. Hence TaeKwonDo (foot-hand-way) means literally "the art of the feet and the hands" or "the art of kicking and punching". Different schools and/or styles may impose different variations on the formal definition however. For example, some styles add the words "self defense" to the literal definition and/or throw in some form of the phrase "physical and mental training". 2.Poomsae:or Patterns are a set sequence of movements that consists of the various fundamental stances, blocks, punches and kicks logically arranged in a mea...(jenis-jenis gerakan atau form untuk gerakan taekwondo rasanya....)biasa dengar masa coach training budak-budak yang talipinggang merah dan hitam.Juga bermaksud "a series of defending and attacking movements performed against imaginary opponents in a set pattern." 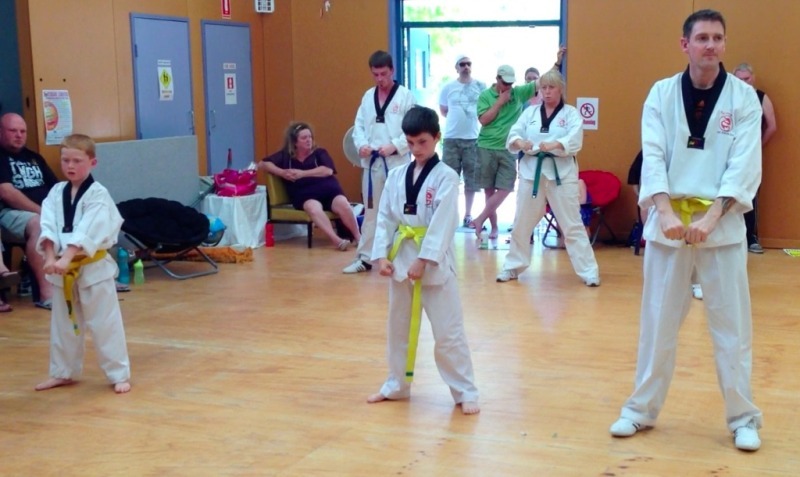 3.Taegeok/taegeuk: a poomsae form which is required for all colour belt student in Taekwondo worldwide. 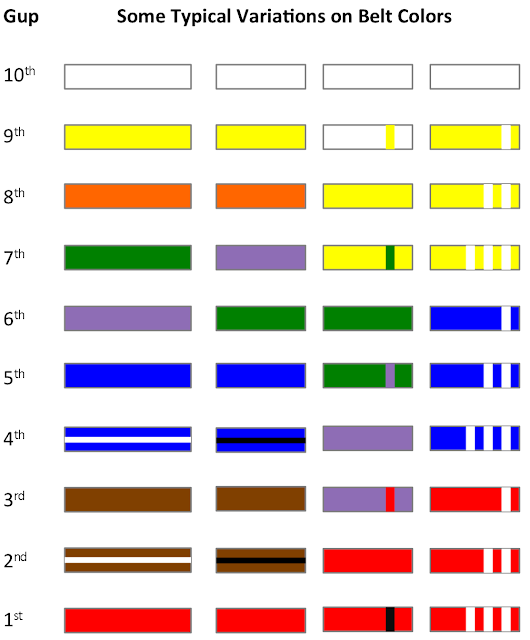 The World Tae Kwon Do Federation has 8 colored belt forms and 9 black belt forms. The colored belt forms are all numbered one to eight and are called Taegeuk. Taegeuk 1 (IL JANG) - A series of actions expressing the KEON principle of Palgwe. KEON represents heaven and light, which is the beginning of everything. Taegeuk 2 (YI JANG) - A series of actions expressing the TAE principle of Palgwe. TAE represents joyfulness so this should be performed gently but firmly. This principle teaches us that mind must remain firm, but outwardly we must appear gentle. Taegeuk 3 (SAM JANG) - A series of actions expressing the RI principle of Palgwe. RI represents fire and the sun. Fire gives us warmth and the sun gives us light, and both represent hope. It should be performed rhythmically, with some outbursts of energy and with passion. Taegeuk 4 (SA JANG) - A series of actions expressing the JIN principle of Palgwe. JIN represents thunder. Thunder and lightening are sources of fear and danger. This principle teaches us that we must remain calm and brave when faced with danger and fear. Taegeuk 5 (OH JANG) - A series of actions expressing the SEON principle of Palgwe. SEON represents the wind. While wind can be terrible as in a tornado, the nature of wind is gentle. This principle teaches us that we must remain humble in mind, and only act forcefully when we must. Taegeuk 6 (YOOK JANG) - A series of actions expressing the GAM principle of Palgwe. GAM represents water and the principle teaches us that we must proceed with confidence when facing difficulty and hardship if we are to overcome them. Taegeuk 7 (CHIL JANG) - A series of actions expressing the GAN principle of Palgwe. GAN represents the Mountain. It teaches us that we must attain the stability of the mountain. We must not act in a hasty manner and should know when to proceed and when to stop. Taegeuk 8 (PAL JANG) - A series of actions expressing the GON principle of Palgwe, which is defined as the quality of being receptive. GON represents the earth, which is the cradle of life. It is the earth that embodies the creative forces of heaven. Antara typical colors varieties yang digunakan utk belt, warna sama tapi variety lain.